Charleston Mayor John Tecklenburg made a special visit to Carnival Ecstasy earlier this week to thank the onboard team for their recent donation of more than 250 chairs to 180Place, a homeless assistance center in Charleston. The donation was part of an ongoing support initiative in which the ship gives tableware, mattresses, bed frames, clothing and other items to a variety of local charities and social service organizations. 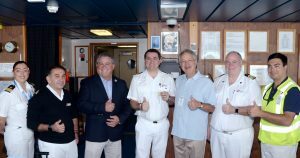 Tecklenburg cited Carnival Cruise Line’s outstanding community service efforts as the reason for presenting Captain Arik Mazzi and his team with the prestigious Key to the City of Charleston during a ceremony on the ship’s bridge. Pictured here is Tecklenburg with Mazzi and Carnival Ecstasy leadership, along with port agent Gary Santos of Inchcape Shipping Services. Carnival Ecstasy operates year-round four- to eight-day cruises to the Bahamas and Caribbean from the Port of Charleston.